Now that several days have past since our return from Italy, I want to thank you for what was a amazing vacation. The itinerary was fund and varied, the hotels were beautiful, and the walks were spectacular. We particularly appreciated the fact that you made it so easy for us! We loved being able to rely on the information packet when we needed it — and to mix it up when we were feeling adventurous. Thanks again fro everything! You will definitely be hearing from us the next time we plan a trip to Italy. Fortunately we did the first bit on our way down to Praiano with clear views!! We are both senior citizens as you might know and we managed without any accidents to walk it all!!! I recently arrived back home from my Jewels of the Amalfi Coast self guided hiking trip and wanted to send you a note while everything is still fresh in my mind. I just wanted to let you know what a wonderful time I had exploring the Amalfi Coast and how impressed I was with Icnos Adventures. The hotels were all charming, well located, and had EXCEPTIONAL service. The package I received upon my arrival in Amalfi was above anything I could have anticipated. 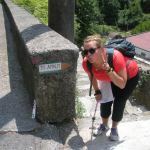 The daily hiking and transportation instructions were extremely detailed- I never felt misguided or lost. Once again thank you for putting together such a wonderful holiday. “We had an absolutely wonderful time in Italy, made perfect by your excellent planning for us. We will be getting a raving review onto your web page. In the meantime, we have told all our friends, especially our hiking friends, what a wonderful trip we had. We have been back home for almost a week now, and I have been going through my pictures (~2000! ), reliving a wonderful trip. I am again struck not only by your very good directions, but also the overall itinerary, which very nicely combined food, scenery and walking. All were excellent, and we will add a very positive review to Trip Advisor and wish you another busy season next year! […] We had many wonderful meals, and really enjoyed the small restaurants where the chefs take great pride in their cooking. Otherwise, everything was excellent: the transfers all worked well…. The accommodations were all very pleasant. That was another special experience. 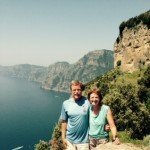 We are a group of 5 couples (10 people), all in our 60’s, who spent 2 full days and 3 nights hiking and enjoying Cinque Terre. We stayed at the Hotel Carla in Levanto, which was very comfortable and fit our needs perfectly. On our first day of hiking we were guided by Guglielmo (William), who walked with us from Manarola to Corniglia to Vernazza, a total of about 11 miles up and down the hills, moderately strenuous. We then caught the train to Monterosso for wine tasting, and then back to Levanto. Guglielmo was a good judge of our fitness and capabilities, and we were tired, but not too tired by the end of the day. On the second day of hiking we were guided by Andreas (Andrew), first going by train to La Spezia, by bus to Portovenere, and ferry to the Island of Palmera. We hiked up and down Palmera, a total of about 8 miles, moderately strenuous. We then caught a ferry back to Levanto, affording us a spectacular view of all the villages of Cinque Terre. The hiking between villages on the first day, and the ferry trip on the second day were the highlights. I have to mention that ICNOS arranged dinner reservations for us all 3 nights at different restaurants, and all were wonderful. The only “problem” we encountered was too much food for us to eat at one of the restaurants! It was all delicious. I am convinced that Italian food is the best in the world. In summary, ICNOS anticipated our needs and made all the appropriate arrangements so that our brief trip to Cinque Terre was an enjoyable and memorable experience. I highly recommend you to anyone else considering a similar trip! we did receive the packet of support materials in Amalfi–thanks, it was all very detailed and thorough. and thanks for all your assistance with hotel reservations, in Amalfi as well as Florence, Siena, and Rome. everything worked out very well. We are back in N.Z after our overseas trip to Europe. We had a wonderful time and the highlight was our Amalfi walking tour. We thank you for looking after us in putting together a well thought out itinerary, excellent walking notes, great accommodation and dining/ restaurant recommendations. Everything went very smoothly, was fun and exceeded our expectations. This is a result of your excellent local knowledge and planning. We will come back to Italy again in 2016 and will do another walking tour with you. 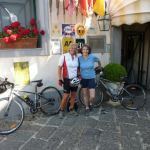 Sandy is determined to go to Lake Como so if you decide to branch out further into that area then please let us know. First of all, may I thank you for organising a wonderful walking holiday for me. Every part of your detailed information was useful and ‘worked’, all the way to Rome… I have not been able to email you before, as I was then in Rome for a week on an academic conference, a very different experience indeed! I am now back in London, and have just looked at the 290 photos I took of my trip to the Amalfi Coast – unfortunately, as my camera is just a cheap digital one for snapshots, they don’t do it any sort of justice, but they did remind me of some of the outstanding sights I saw. All of the travel advice and timetables were absolutely right, and the only difficulty I had was finding the bus in Salerno – because it was right in front of me! I was too impatient and went on to other bus stops before returning to the obvious one. The drive to Amalfi, sitting on the left hand side, was amazing. The hotels were each very different: In Amalfi, big room, friendly, old-fashioned (which I liked); Praiano, rather small room, but very friendly staff, great breakfast, great view; Positano, amazing room! though it was a little more impersonal as Positano is ‘something else’ altogether! and the Hotel in Sorrento was a very good ‘solution’ for my brief stay in Sorrento. As for the walking: I followed all your advice about clothing and walking sticks and you proved to be absolutely right. I was worried about the heat, but with the hottest day at 31 it was OK and I didn’t get burnt or exhausted. Each one of the walks had something interesting, different and special about them, and I enjoyed each day. On day 2 the gardens of the Villa Cimbroni were very restful and, as a great reader of D. H. Lawrence, all this was very interesting to me. I think probably just for walking, day 3, the Valle delle Ferriere with the waterfalls, was my favourite. And perhaps my favourite place was the little church and square at Minuta – just a pity the church was not open. One of the highlights of the holiday was definitely climbing Monte Tre Calli, because that was the first point from which I saw the amazing view all the way down the coast to Capri. While I was up there it came on to rain quite hard, so I returned to Bomerano rather than going all the way round because I was on my own, and thought it would be a bit irresponsible to be scrambling over the wet rock. The whole walk on the next day was great. I loved the Monastery of San Domenico, where there is a fresco dating from about 1400, and also a man selling refreshing lemonade, figs and olives. And the path of the Gods was lovely with all the views down the coast and to Positano. Great view from the Santa Croce! 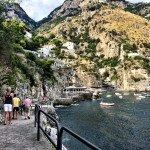 And then you hit Positano – something of a culture shock!! Get out the smart clothes. The visit to Capri was memorable. Huge crowds, but as soon as I started to walk to the Villa Jovis, very few people indeed. Coming rpound to the Faraglioni rocks was remarkable, another highlight. However, on a Sunday the Villa Jovis and Certosa di San Giacomo both close at 1 pm, so you have to make a choice between them. Perhaps go quickly to San Giacomo first? By the time I got there it was closed, which was my only disappointment in the whole trip. I decided not to go to Pompeii as I had been there 40 years ago, but if I had had another day I would have liked to go to Herculaneum. I am very grateful for all the information you provided, and the reading on history and art. It was a wonderful six days, full of variety, interesting places large and small, and great vertical! views everywhere – quite ‘do-able’ for a reasonably fit but 65 year-old red-haired Englishman in the height of summer. I strongly recommended you to friends in Rome who were thinking about the same sort of experience, and I will certainly recommend you to any friends in London who are looking to go walking in Italy in future. It could not have been better, and your helpfulness in the instructions and on email from both of you was truly outstanding – so grazie mille! ICNOS Adventures’ The Jewels of the Amalfi Coast package was more than what I imagined. Pre-trip emails were responded to quickly and thoroughly. The customer service prior and during our trip exceeded my expectations. Anna was more than helpful, offering and providing aid for our trip that was not related to ICNOS’ hiking package. Her above and beyond assistance was invaluable to myself and husband in making our trip a success. The hiking instructions were very good. At the end of the first day of hiking, I recommended ICNOS to another hiker who was not happy with his company’s hiking directions. Marcello telephoned me twice during the trip to confirm that everything was going well. The customer service is superb. I would not hesitate to recommend or use ICNOS again. Well done Anna and Marcello and all who work at ICNOS Adventures! Apologies for sending this in so late! William may respond separately but I wanted to send you my feedback while the impressions are still relatively fresh in my mind. We were both so happy that we chose to have ICNOS plan our trip. We had a wonderful time and so enjoyed hiking along the coast and connecting with the land and the people in a way that I don’t think would have been possible in such a short time had we just travelled to each place via car or bus. 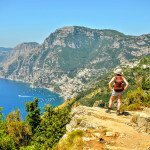 Walking down from Ravello to Amalfi through the lemon groves and hiking on Capri were some of my favorite moments – and I loved the poetic, beautifully written plaques along the trail on Capri describing the local flora and fauna. I was really quite impressed with the level of detail that went into the daily itineraries, maps, restaurant recommendations and descriptions of the highlights of the different places on our trip. I liked the historical background as well – really very comprehensive – thank you. You were so kind when William suddenly had some health issues – very quick to respond, you had great information, you were caring and gave us both comfort that everything would be okay, which thankfully it was. We had a great laugh afterwards at the humor of the situation, with the doctor, 2 ambulance drivers and the hotel manager all gathered in our hotel room, and everyone trying to communicate via sign language! We enjoyed all of the hotel choices. Gracious, attentive and helpful hotel staff everywhere we traveled. I will have very special memories of this trip always, and hope to visit your beautiful corner of the world again soon! We enjoyed our trip to Italy very much. Italy is a beautiful country with incredible natural beauty, amazing art and architecture, and delicious food and wine! On the Amalfi group walking tour, our guide was very good. She is a native to the coast, and loves and knows the areas very well. Some of the hikes were hikes she had done since childhood. She is a naturalist who cares about preserving the natural habitats, while sharing their beauty with people from around the world. The Hotel in Amalfi could not have been better. It was super well-located, with a lovely rooftop terrace, comfortable rooms with handpainted tile floors, and delicious and expansive breakfasts. [….] The winery visit with lunch and tasting was lovely – I will remember the lemon risotto – definitely a trip highlight. We appreciate all the help from Icnos in planning our trip. It definitely made our planning easier to have a contact in the country. Next time we want to visit the Cinque Terre and the northern mountains! “Hello Marcello, we are still in Italy enjoying our second week but want to send you a big thank you for all the work you and your team obviously put into your tours. I know once I get back home to Canada I will be very busy with everyday life so now is best. When we met you on our arrival the first night in Cava di Tirenni, you spoke with such passion about the experience you and your company are trying to provide- the real Italy not the touristy Italy. You never stopped smiling and we felt your passion. every single day we were amazed at the special attention we received- from the hosts of the beautiful places we stayed ; from the chefs at the restaurants you booked for us. And of course our wine tasting! I hope our two cases of wine arrive in Canada safely!! ); from the chauffeurs some of whom we got to know… In short we felt like honored guests each and every day. We hiked hard each day, but liked that there were some easier options to consider, including bus options which we sometimes took. The directions were very detailed and there was only one day where we lost our way, but it quite likely was our fault. We often experienced that- where locals were happy to help even when they couldn’t speak more than a word of English, and my limited Italian, but they would go out of their way to help. My memories of this trip will last a lifetime. If I get a chance to come back to Italy, your company will be my first choice, absolutely and maybe even we can convince our husbands to join us next time!! Please feel free to give our email to anyone who would like to ask us questions. We are just back in Houston (well, three days now), and as I sort through my pictures and settle my accounts, I was planning to send you some further thoughts about the trip and our experience. I will do so shortly. But first, I do want to say that everyone had a wonderful time. This trip ranks among the very best that I have taken, and this is due in no small part to the pre-organization Icnos provided. The trip instructions were excellent, the hotels were delightful, the trails were a pleasure, and the sights and scenery were gorgeous. I really enjoyed that each day’s hike was a bit different, with new challenges, new views, new towns. Even the stairs were fun (at least most of the time). And your recommendation to stay in Naples was perfect! I will follow up with more information, and some pictures – we must have thousands in our possession now :-). And I hope to get back to that area very soon – and to spend more time in Naples next time! What a great trip we all had visiting Italy! The hikes with the views and all the culture were amazing. We loved eating the local specialties, the food, bread and wine, and of course, gelato. Your daily directions were very helpful and the accommodations worked out extremely well. We are now in Milano and winding the trip down. Time for one last pastry and gelato! You made me a star for selecting the Icnos self-guided tour of Cinque Terre. My companions and I had a great time making our way from village to village. The weather in mid-May was perfect for hiking and we were blessed with many sunny days. […] The information packets were really impressive — perhaps a bit overwhelming at first. Finally, I think we owe you some money for the train tickets from Pisa to Levanto that you purchased for us when the Trenitalia web site wouldn’t cooperate. Please let me know how much they were. I wanted to thank you travel arrangements for us these past weeks. Carol and I and the Williamses had a wonderful time. I thought I would fill in a little of our reactions. Our favorite walks were from Amalfi, both the valley of the ancient mills up to Ravello and the other valley down from Scala. And May was perfect for wildflowers and waterfalls. In these walks and the walk to Vietre, surprisingly, we saw very few other walkers. 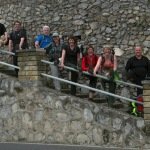 We are all over 60, happy walkers, but these stairs are not part of our ordinary life. And we paused often to examine wildflowers and gardens. So our walking time was slower and the options offered in the directions were ideal for us. We did not take the Tre Calli hike and we took the bus down from Ravello and into Positano. Accommodations: The hotels were consistently very good. We like the modern decor in the hotels in Naples and Sorrento but also the terraces in the more traditional hotels. Breakfasts were lavish and service was very friendly. Like the walks, we would have never found these hotels without your guidance. Transportation: The bus advice and schedules enabled easy travel. Ticket purchase, stop locations, and arrivals times made us much more comfortable. The private transfers were always perfectly executed. We especially enjoyed our time with Luigi. we returned home safely and we still have the afterglow of the wonderful time that we spent in Italy with your guidance. Of course the coast and the places are wonderful, and that is a given… but to have all our arrangements so beautifully orchestrated by you in advance made the experience of this beautiful corner of the world even more pleasurable. From the minute we were met at Naples airport we knew that you guys had your act together. The wonderfully organised welcome package as well as the daily itinerary packages were thoughtfully assembled and very thorough. We appreciated having you close at hand to check in with when the weather did not cooperate, and to know that you were orchestrating the pickups and hotels and everything worked perfectly. The walking was perfect for us. None were too strenuous, but all were enjoyable. We enjoyed finding our own way on the walk in the first saturday through the valley of the Mills and back around through Atrani, which was thoroughly enjoyable and we were glad that we had the ride up to Ravello, rather than enduring that walk up which would have left us very little energy to enjoy the town and the gardens of Ravello… so that was actually a great side benefit to the bad weather!!! Capri was lovely. In fact I have been raving about the hotel to our friends who go there every year! We also thoughtly enjoyed the walk from Praiano to the path of the Gods… especially the stop for drinks at the old monastry. The other magnificent walk was the walk to Jeranto bay. Your directions were all excellent as were your recommendations. The Hotel in S. Agata was a great place to end our tour and we had a hectic one day stay in Napoli. Pompeii was a challenge to find entrance ticket without waiting in a 45 minute long line to the ticket counter… but we did get a tip from a local on where a side entrance and ticket office was located that shortcut this long line. This is a tip you may want to share with your clients. My wife and I have done a wide variety of different styles of travel, form self guided to fully guided, but this was the first time we have done a private prepared daily self guided itinerary that you prepared for us, and we thoroughly enjoyed it. We would highly recommend ICNOS to anyone with a spirit of travel and adventure. “Our trip was absolutely the perfect way to celebrate Gwenn’s 50th birthday. You delivered all that we needed to make this a hassle free journey: from the recommendation of the hotel in Napoli and all of the hotels along the route in the coast of Amalfi we were very well taken care of by the innkeepers. Just wanted to say thank you for your part in my fabulous trip. All went well on the Cinque Terre adventure. I modified a couple of the days as the weather was a little unkind but the changes I made worked out perfectly. Thanks again for your professionalism. Have a great Christmas and all the best for the year ahead. 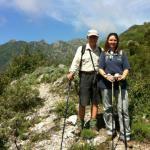 “We thoroughly enjoyed the ICNOS Adventures Deluxe Amalfi Self-guided Hiking Tour. Everything met or exceeded expectations. Even the weather cooperated. 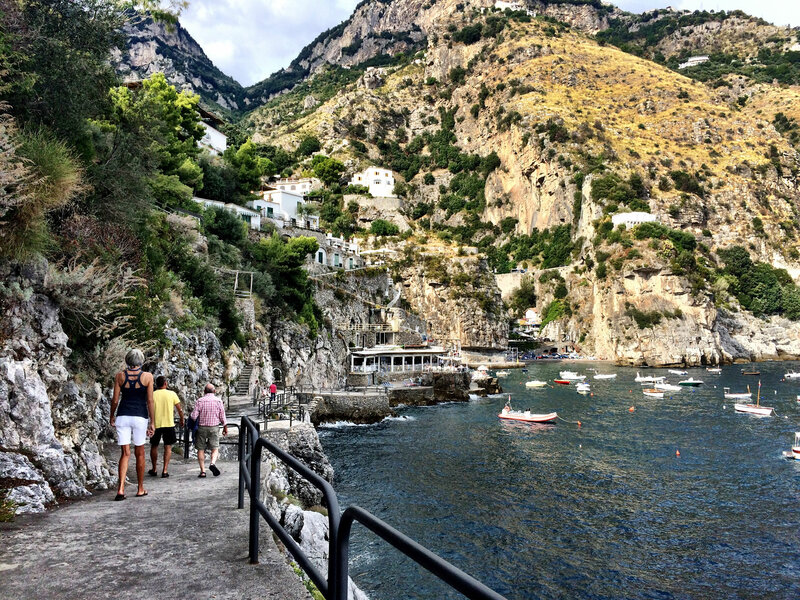 It was our first trip to the Amalfi Coast and our first self- guided tour. We liked the self-service aspect giving us the feeling we were travelling on our own but with some of the details handled for us. ICNOS Adventures provided many options. We usually chose the most strenuous options and were not disappointed. The instructions were perfect. We were never lost. At least one hiker commented that our ICNOS Adventures instructions were much more detailed than the instructions he had from another company. Certainly one of the highlights was the service provided by Anna and Marcello prior to the trip. They responded promptly and with great detail to our questions and special needs and desires. We had great confidence prior to leaving home that our trip would be a fantastic experience. ICNOS Adventures gets a high recommendation from us and we will look to them for our future travels. “Ciao, Hope all is well. We are back in the USA and we just wanted to send a note to you thanking you for a wonderful hiking experience. We all had a fantastic time! Your suggestions and self-guided walks were wonderful and the hotels provided beautiful views over the Mediterranean. Thank you so much for booking these hotel rooms. The staff at all the hotels were so friendly and handled our luggage without a problem. We thoroughly enjoyed the cooking class and loved the Path to the Gods. We made it to Pompeii and we were very glad that we did. […] Thanks again and hope to take other hiking trips in Italy someday. “Ciao Marcello, we have ended our tour with ICNOS and Italy. Most of us are now back in Singapore. It had been a wonderful 7 days in Cinque Terre & Portofino. The weather was great and Francesca was an excellent guide. My friends loved her enthusiasm, professionalism & knowledge of the area. She adjusted the program to suit us as some of the members had difficulties in physically challenged terrain. Thank you for all the arrangements. Everything,including the weather, was just great. We would certainly like to do the Amalfi Coast with ICNOS in the not too distant future. The accomodation in Cava de’ tirreni was an exceptional place – beautiful! The Hotel in Amalfi was excellent for its location, welcoming and helpful staff, as well as amenities. The Hotel in Praiano was certainly satisfactory, but not well-located nor as welcoming. Tour format & guidelines – very well done, exposing us to the known attractions as well as the general area. The information provided was thorough, almost to the point of being over-whelming at the start (this of course eased as each day passed)… The only item we didn’t do was the cycle over the mountain to Sorrento. Instead we swam in the ocean at Positano (we actually swam every day, at Praiano, Positano, Capri Amalfi- with best swimming at Positano. We are both good swimmers who loved the clear, deep water.) I was a little disappointed that Capri was so commercialized, but nothing you can do about that. Thank you again for your efforts on our behalf. We would love to see you if you ever visit Canada (Winnipeg or Vancouver Island). In the meantime, we wish you the very best, and thank you for all of your efforts on our behalf. We’ve just returned from our second day of walking in Amalfi. Thank you so much for the very detailed and accurate guide for each of our walks. We’ve been delighted to experience the Valle delle Ferriere and today plunged into the almost icy waters of the stream. How refreshing! I don’t think it would be possible to explore the area in such depth without your help. For the most part we’ve hardly seen anyone on the same trail although today a man passed with his goats solving the mystery of the bells we kept hearing in the valley. We look forward to each day ahead of us. “This walking tour was just amazing in every way. Our accommodation was just perfect from the beautiful accommodation in Cava de’Tirreni, with our gracious hosts, to the lovely B&B in Tramonti […]; then the delightful hotel in Amalfi with their enthusiastic welcoming staff, to the lovely small but ever-so-peaceful hotel in Capri with its lovely terrace overlooking the 12th century Carthusian monastery and no TV. This is something that is not important for these enthusiastic walkers! ICNOS give great attention to detail and we cannot fault them in any way – from being met on the train in Naples, met in the various villages at the end of a hard day’s walking or transported to the beginnings of walks at the start of the day by courteous drivers who could speak some English giving us some of the local flavour of the area. When you don’t speak the local language it is great to get off a train/boat in a strange land to be greeted by an ICNOS sign with your name on it. It takes the stress out of travel. Also the restaurants that we were booked into to experience the local food were all superb. At the end of a glorious day of walking it is great that we did not have to make further choices about ‘where will we eat tonight’ and to know that we will eat well. As a foodie with a great love of Italian food it was just another enriching dimension to this fantastic trip. All of our routes were well planned and the walking offered many varied experiences – walking through shady woods, through lemon orchards, olive groves, vineyards and the many, many steps (thousands! ), with fabulous views along the way. Part of the Amalfi experience! The walking tour requires a reasonable amount of fitness, but not too hard for these retirees. Thank you Marcello and Anna for the wonderful trip and all the organisation that lies beneath making it so successful. It was also great to meet you personally. 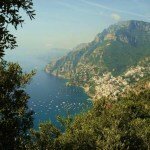 My walk on the Amalfi Coast in September was the most wonderful and rejuvenating holiday. I’d like to thank and congratulate you all at ICNOS Adventures for making such an extraordinary experience so easy and available. As a single lady looking for a self guided walk I was delighted to find you and you didn’t disappoint. Everything was perfect! All your walk information and planning information so impeccably organised complete with options for other activities providing alternatives to the standard itinerary if a day off from walking was what I felt like. You had everything covered – even what bus tickets to buy! And no doubt your local knowledge was behind the hotel choices … All of them in the best locations. A special thanks for the extra day sea kayaking which was just fantastic (thanks to Antonio and Julio) and whatever you did to arrange the perfect Mediterranean weather. I’ve sent a couple of photos that I took on the most challenging day of the walk … Praiano to Nocelle and then down the stairs to Positano. I have so many beautiful photos from the trip, but this day’s walk was especially memorable. We are happy to tell you that we had a wonderful time on our recent September adventure, Jewels of the Amalfi Coast. We were so happy to have your courteous driver meet us at the Naples airport when we arrived after our very long flight…and to meet you, Marcello, and be personally handed our itinerary. The weather was perfect. The hotels were comfortable and well situated with friendly accommodating hosts. Our baggage was always miraculosly waiting for us at our next hotel after a long day of walking. Hiking directions were very well explained. We enjoyed walking through the lemon and olive groves looking down at amazing views and having unexpected adventures such as meeting two horses blocking a narrow trail! They courteously let us pass. We were so happy that you provided us with options for those trails and steps that seemed to be too much of a challenge for our 72 year old legs. We did what we could and thoroughly enjoyed ourselves. The private guide you contracted for us in Pompei really helped to bring the history of the site alive for us . I don’t think we would have gotten so much out of it on our own. The Hotel in Rome was perfectly situated to walk to most sites or easily get public transportation. There were wonderful restaurants nearby as well. We thank you so much for a planning this wonderful adventure for us. It was just the right amount of planning on your part with plenty of room for us to do our own exploring at our own pace. What a holiday we had, we are now home safely, and I know that all the walkers were most impressed with the service and extensive information provided by Icnos. 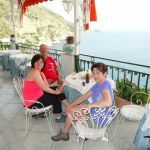 Our week on the Amalfi coast was very pleasant, but we found that we did not have the energy and time to do much other than travel from one town to the next explore the town, relax a while, have dinner and sleep. We also found that the train and bus option was less than optimum and used the Ferries which, although more expensive, gave a much more pleasant experience and took less time. We also got good feedback from the Hotel people about Icnos as one of the “more serious” operators that they deal with. We particularly liked the Hotel in Sorrento. The most important factor in all hotels is the bed, it must be comfortable and not board like. We will recommend you guys to anybody travelling in Italy and you can expect a call from us the next time we visit Italy. Finally I want to thank you Marcello for you endless patience with me and some apparently dumb questions before and during the trip. First we would like to thank you both again for helping us have such a wonderful holiday experience. We will have lasting memories of our fantastic first trip to Italy. We loved all the places we stayed and visited – we found each place had a unique charm. We especially loved the detailed agenda you provided for each day – it was so helpful. We thought you may be interested in our feedback on hotels, restaurants, etc. The hotels overall were great choices and we were very pleased with these. The staff were friendly and very helpful. Although we didn’t spend too much time at the hotels it was always nice to have a clean, friendly and comfortable environment after a long day of walking. Your restaurant choices were excellent. The drivers for all of our transfers were very nice, friendly and helpful people. We loved the spectacular walks which were the highlight of everyday. Your detailed instructions, comments and suggested made our walks even more enjoyable. The Path of the Gods was incredibly beautiful! We can’t stop looking at all of our many photos and reliving each day! We cannot thank you enough for all your assistance along the way. We already have friends asking for your website and information and we will highly recommend Icnos! It has taken me longer than intended to mention some of the things that we found to be significant in allowing us to relax and enjoy oursurroundings. Understanding the Language was an issue we thought could prove troublesome but it was not an issue. Every person were introduced to Icnos were interesting, very helpful and were never late or missing from the nominated place/location. The accommodation we enjoyed was well matched to most of the things we like , interesting locations, quality meals where we stayed and warm greetings from our hosts. Our arrival in Naples , the private pick-up and delivery to Cava de Tirreni was the trigger for our relaxing and enjoying ourselves . ICNOS organised some amazing hosts and we felt spoiled but appreciative of the planning and follow through (we certainly tested the system by not checking whether the taxi was DEFINATELY our booking) Marcello was most helpful in sorting out our initial mistakes and managed to keep his cool. The information package that we received when we checked into our Cava de Tirreni hotel was stunning and the comprehensive description of our future hikes helped us to rise early and get on the trail at each subsequent location. The Isle of Capri was a stunning surprise for us, the hike to the Blue Grotto along the cliff top tracks was superb, the colour of the sea, we rated it equal to the Path of the Gods Trek . 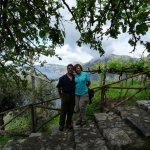 We left Italy with broad smiles on our faces having had our best holiday yet and at my tender age of 70 I never felt that I would cover our ICNOS itinerary but my younger wife made sure we followed and enjoyed the next day treks. Marcello and Anna, your organisational skills and the follow thru was appreciated. 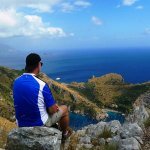 If you want to offer any of your future English speaking potential clients the opportunity to contact or discuss aspects of our hikes , you have my permission to share with them my email address. “Hi, Marcello, the Cinque Terre tour was wonderful. Thanks for your arrangement[…]. The daily itinerary was well prepared and was easy to follow as if there was a tour guide leading the tour. Touring Cinque Terre was a memorable experience and I thank you for making this experience possible. “Hi Marcello, I just wanted to let you know that this was a great holiday, Susanne and I had a great time and everything worked out just perfect. Hotels were great, very friendly people in Cava and Amalfi […]. We are planning another trip for October. The last 2 days of our trip were quite hot, we did not do the full hiking options, but I am sure we will come back for it. Thank you again for everything and we will definitely recommend ICNOS. “Thank you Marcello and Anna for another wonderful walking vacation – this time in the magical Chianti region of Italy. Once again the accommodations were superb, from a lovely country home set in a working vineyard in Greve to an elegant palazzo in Radda and a stylish and well situated hotel in Florence. As we have come to expect, the walking directions were accurate and easy to follow, providing general information about local history and culture and reliable recommendations for food and other stops of interest. We walked in virtual solitude, through postcard perfect Tuscan landscapes: vineyards, olive groves, picturesque medieval villages and cypress lined laneways. Among the highlights of our trip were the walled village of Montefioralle and the wine tasting in Radda – where we were warmly welcomed and had the opportunity to sample many of the region’s fine wines, rarely available in North America. The Jewels of the Chianti would be a great introduction for anyone thinking of doing a self-guided walking tour for the first time, but we recommend it to walkers of any age or experience level! “Thank you so much for organizing such a fabulous trip for us! It was beyond our expectations. The information packet was great (we really appreciated all the additional info and the book). The accommodations were all very nice. Thanks for also providing the hike near Marina del Cantone, it was awesome. We hiked all the hikes that you planned for us and each day we were in awe of the beautiful views and scenery. It was just superb. We can’t thank you enough. We have already recommended ICNOS to some other hikers we met on the train and we will tell our friends. Sue & Kevin, Marshall, VA, U.S. I would like to begin by sending you our warmest gratitude for all your professional work for us. Everything was perfect, the hiking trails, the maps and the guidelines, the hotels, the transport and the amazing landscape. Even the weather couldn´t have been better. In short we had a wonderful time and we can recommend ICNOS adventures to everyone that is thinking of visiting Italy. I hope we will have the opportunity to work with you again someday. “My Dad and I had the most enjoyable holiday imaginable with ICNOS in May this year. As Marcello and Anna told us, May is a wonderful month to visit the Amalfi Coast. After a long cold winter in the UK, being out everyday under the Italian sun, breathing in the fresh sea air and beautiful scents of spring, was truly heaven. Every day we marvelled at the views and slept incredibly well after a days walking in the lovely hotels organised by ICNOS. The staff at each hotel, but especially the first in Amalfi, were great. We will treasure the memories of all that time spent together leisurely walking up and down thousands of steps! The whole trip was incredibly well organised and we can’t wait to do more trips with ICNOS in the future. 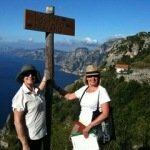 “In march 2013 my group of 8 Icelanders went on an adventurous trip “Charming Amalfi Coast” organized by Icnos Adventures. The trip was a total success for everyone in the group. Everything promised by Icnos was up to and above expectations. The guidance material was accurate and offered various options that allowed flexibility in distance and difficulty. Each day was different and the journey led us from narrow alleys via a lot of steps up and down and along paved and unpaved trails thru small villages to the mountains and woods and the magnificent ruins of Pompei. A lot of wonderful variety. All hotels were perfect and well placed. Transportation was good and extra arrangements made for us were done with a smile. And we got all kinds of weather too. Everyone in the group has wonderful memories from this week in Italy and Icnos will be our first option if we visit this region again. Thank you everyone at Icnos Adventures for this wonderful experience. We can sincerely recommend the services of Icnos Adventures. “Dear Marcello ICNOS, Anna & yourself have exceeded our expectations and have made our stay on the Amalfi Coast absolutely seamless and enjoyable- Thank you for taking such good care of us every step of the way. We hope to return to Italy again one day. We will highly recommend ICNOS to our friends! “Thanks again for this fabulous trip that we just completed. We only had three days to spend on our hiking trip and you planned a spectacular well planned and exciting vacation for us. We had a great time. And we’ve already recommended your company to others interested in following our footsteps on the Amalfi Coast. So if we can give you an Amalfi Trip score – we give you a 9 out of 10 (I guess there’s always room for improvement – and we know that you are the kind of person who will ensure that you always strive for a perfect 10. Once again, thank you very much for your personal guide and tour. Rochelle and I are most grateful to you for guiding us. You are definitely in the right business for you and we so very much appreciate it. “We just finished a self-guided walking tour of the Amalfi Coast, sponsored by ICNOS Adventures, an amazing organization. Everything that they arranged was perfect. By the time of our trip, I felt that Anna and I were practically old friends, after all of the questions that she answered for me via email. We arrived at Naples Airport and they arranged a private transfer to Amalfi, taking away the normal jetlagged, first-day-in-a-new-country-trying-to-get-to-your-destination issues. Once at our hotel, we received our huge packet of detailed walking plans (one per day), maps, tourist guides, bus schedules – absolutely everything that you would need. The detailed walking plans were wonderful, complete with locations to lunch or pick up a picnic to take with you, and they provided you with choices of different hikes, and of options if you wanted to shorten or reduce the hike with a local bus. We loved all the hotels that they chose and would recommend them to anyone. And when Hurricane Sandy impacted our return home, we sent them an email at 9:30 on Sunday night, and received an answer in minutes, a phone call from Marcello in the morning, and an email followup resolving all the issues, including the fact that our return might be delayed by more than one day. We trusted that they would take care of everything for us and they did. “We explored the Amalfi coast in early October, following your maps and info material and staying in three recommended hotels. We had a great time–wonderful views from spectacular mountainside trails (challenging climbs at times); friendly, clean, comfortable rooms at hotels, each with it’s own unique charm (eg, great breakfasts on terrace, massage tub, or large private breakfast terrace). We’d do it again in a heartbeat. Thanks for going the extra step by calling us to see how the days went and for providing additional information on alternate routes to return to Rome! “Thank you for the most wonderful week on the Amalfi Coast. That was the most peaceful and beautiful vacation I have ever had. Your program was excellent and there is nothing I would change. I will watch your website for other opportunities travel with ICNOS. Please include me in any newsletters or emails you send out. “Ciao Anna, Thank you so much for organising such a wonderful program for us on the Amalfi coast. The organisation, accommodation, walking instructions and of course the scenery were all superb, and could not be faulted. We would most definitely recommend you to any friends who may be thinking of going to Italy. You even organised magnificent weather! Both of us returned home invigorated and refreshed. A sign of a really good holiday. We had a very nice trip to Italy late August – beginning of September this year. We stayed in Monterosso which is one of the five villages for four days. It was good starting point for walking with very frequent trains arrivals. This area is unique and picturesque. It is well organiced for walking in quiet environment with minimal traffic. After our stay in Monterosso we stayed in Santa Margherita Ligure for two days and walked between San Fruttoso and Portofino which is very nice walk. The walks were well organiced and diverse. In hole we were very satisfied with our trip and many things to see and experience in these six days. All the hikes were very well chosen and interesting. This area is great and I am sure that the Amalfi coast is interesting too, I hope we will come back later and then we will have you in mind. “The Amalfi Tour with ICNOS Adventures is still vivid in our minds and one of the highlights of Italy. The friendly, knowledgeable and very caring tour guide that we had. A pleasure to be with. He made the effort to spend extra time with the group and gave extra information about the walks. The walks were spectacular and in many places breath taking. Although some walks were challenging, this was communicated pre tour and we made sure that we had an adequate level of fitness before we started. The coast line and the vistas were outstanding. The selection of hotels was excellent. Very comfortable with friendly staff. The locality of the hotels allowed for easy access to the local area. Breakfasts were very good providing a nutritional start to the day. Restaurants for lunch were positioned with panoramic views of the coast which added to the experience. The one at Ravello was mind blowing. I still look at the photographs now in awe. Suggestions for dinner, which we took and all the group came on were fine examples of local cuisines. The stay in the monastery and the dinners was a highlight. Very friendly and relaxing. Wasn’t long into the tour that we were feeling that we belonged to a big family were everyone looked out for each other. This made it a very personable and a comfortable week. Transport arrangements to and from Napoli and throughout the tour were well thought-out with professional drivers. This made us relaxed and confident. Marcello, once again thankyou for such a memorable experience. If we tour Italy again we will certainly contact you. 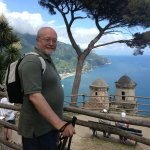 I’ve finally had time to sit and write my review of your wonderful guided walk on the Amalfi Coast in September this year. It was exciting, challenging but rewarding and totally memorable. 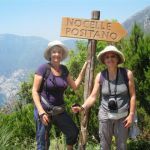 Your organisation was without fault from the provided equipment, the fantastic hotels, the great venues for lunch and dinner and of course your terrific guiding through the tracks of the Amalfi. We were so fortunate to have such friendly and helpful people on our walk with us and hopefully we will all stay in contact. I especially appreciated your thoughtfulness Marcello in organising alternate arrangements if we didn’t want to complete all aspects of the walk!!! I have spoken many times of your wonderful tour to my friends and I’m sure you will see some of them in the future. “I enjoyed a wonderful week on the Amalfi Coast- good food, good company and invigorating walks through beautiful countryside. Marcello was not only a guide but a delightful ambassador for his country. 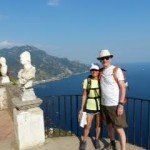 I would recommend this trip to anyone who wanted to experience the Amalfi Coast in an active way Accommodations were excellent and all of the group’s needs were well taken care of. The trip to Pompeii was interesting and informative. Before the trip, all questions were answered promptly and helpfully. All in all, a first rate experience. “Ciao Marcello and Icnos Adventures, Wow! What a trip. You put together an AWESOME guided walking tour. You were well prepared with your itinerary and charts of the grades of the hikes to show us what the challenges would be, loved the map where we could highlight the trails of the hikes everyday and also want to Thank You for the use of the walking sticks (they were very useful). The hikes were amazing (at times we felt like the goats we saw grazing on the side of the mountain), the accommodations were first class, the different varieties of the food we tasted was fine Italian cuisine, and your knowledge and history of the Amalfi Coast was very impressive. What was our favorite part of the Walking Tour? That is hard to answer, because everyday we saw and did something different and were amazed and exhilarated with the beauty and history of your Coast. You made the whole hiking experience totally unforgettable. The views from the top of the mountain down to the port cities where we were hiking to were spectacular. You teamed the 4 of us up with 7 others from one end of the world to the other that we did not know and we left the tour, best of friends. Looking forward to our new friends including you Marcello and your wife visiting us here on the West Coast of Canada so we can show you our Island. Will definitely contact you when we are ready for another walking tour in Italy. “We chose ICNOS after careful consideration of a number of other options for self-guided walking. We believed ICNOS offered best value for money with a realistic itinerary and well chosen routes. We felt confident before we left Australia that everything would be in place for our arrival. Marcello gave concise information, and was at the first hotel to greet us. He went through all the documentation we needed for our week’s holiday and assured us we could contact him at any time if we needed advice or assistance. He was true to his word, making himself available to deal with all of our enquiries and other matters which he willingly undertook to follow up on our behalf. The accommodation selected exceeded our expectations. The level of detail provided in the walking directions and accompanying maps was thoughtful and very well packaged. Each day was carefully planned, with suggestions for sightseeing or taking public transport instead of walking. Marcello’s thorough preparation ensured that we successfully completed all our walks and had a fabulous holiday. We shall certainly use ICNOS next time we visit Italy. “We like to thank you so much for all your efforts and help to put our Amalfi Coast Trip together. The service you are offering is absolutely outstanding: the maps and walk descriptions were so helpful and 100% accurate, the accommodation choices were of high standard and extremely friendly and the walks you put together were absolutely spectacular. The care you put into the planning and contact with your customers is of the highest standard we have ever experienced in travel. We really enjoyed our long chats during the walk to Cetara, it was a privilege that you decided to join us for this walk and show us a very special part of your home. Every day was full with highlights and memories which will stay with us forever. 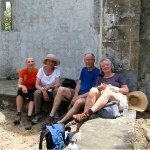 We will definitely tell all our hiking friends about the outstanding walking tours Icnos offers. We are looking forward to coming back to Italy one day and explore more of the country on one of your walks. And if you ever come to Australia, don’t forget a ranger guided walking tour in the Alps is still on offer. 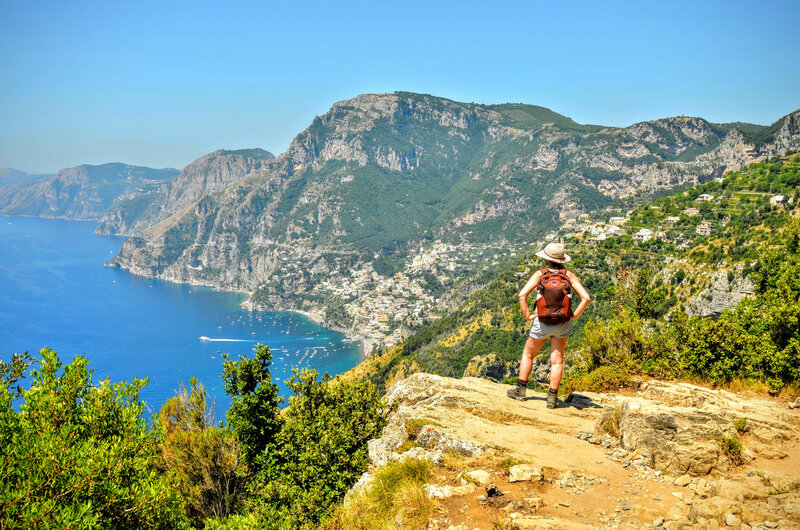 “A very hearty Congratulations to Icnos Adventures on ensuring that we enjoyed, to the full, our chosen 7 day self-guided walking tour of the Amalfi Coast, Italy. From the very beginning we felt confident that we were in safe and professional hands. During the months of pre departure e-mail communication, it was obvious that nothing was too much trouble for Anna and her team at Icnos.On arrival at our hotel we were met by Marcello who supplied us with extensive information on Italy for tourists along with comprehensive maps, notes, and bus and train timetables. Also included were suggestions on places of interest and restaurants of varying prices to visit. The beauty of the areas and villages we walked through left us entranced and all our accommodation was first class with friendly and helpful service. We loved each and every day with its many delights and experiences. This was a beautifully organised holiday with no hitches – and with the personal touch. WOW! We had an amazing time and have brought home many special memories (and hundreds of stunning pictures) of our time spent in Italy! Lastly we also would like to acknowledge our appreciation of Icnos’s environmental awareness and community involvement in the area. Grazie Anna, Marcello and the Icnos team. We hope to have the pleasure of organising another trip with you some time in the future. “Thank you for organizing the walking tours for us. It was a very special occasion, as it was my sons 30th birthday celebration. The walks were truly outstanding and so amazing. We would not have been able to do what we did without your help and guidance. I am really grateful for all your detailed information. It is very difficult to say which was the best one! as they were all unique and special. So many memorable occasions and cannot wait for our next walk. Thank you once again for a really stunning holiday. We have had a great holiday organised by Icnos Adventures. We will be commending you to all our friends and acquaintances. You did a marvellous job on our self guided holiday, a lot of thought and time went into the detail and step by step instructions. It pretty much went like clockwork apart from a couple of little things that no one had control of. We were very impressed with all our accomodation and location, close to transport, in ‘character’ areas. We certainly would have been unable to arrange that for ourselves. 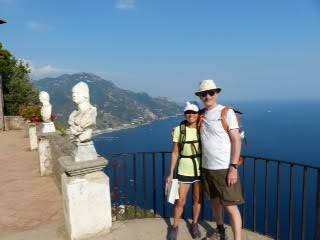 We ‘loved’ Amalfi, that was our favourite place, the location, walks and stunning scenery. We didn’t get to Herculaneum. I didn’t matter, you can’t do everything and what we did do and see was terrific. Thank you both very much for your time and effort and a fabulous holiday. 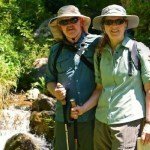 “What a fantastic hiking trip you organized for us – each day was a wonderful adventure! “Gratie mille – thanks a million – for organizing and leading us through a wonderful holiday in your very special country. “We have enjoyed your company, organization and guidance very much! You have a beautiful country and it is wonderful to see your pride of it. 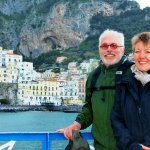 “Mark and I used Icnos Adventures to help us plan a two week self-guided trip to Southern Italy and the Amalfi coast. We wanted to spend our time hiking and siteseeing. Icnos did an outstanding job planning our trip. Anna and Marcello were very responsive to our mails and helped us with many requests. We were able to enjoy being on our own without the hassle of of planning every detail, Icnos did that for us. We’ve traveled all over the world, and this was one of our favorite trips thanks to Anna and Marcello at Icnos Adventures. We have just returned from our five weeks in Europe and we have to say that our Amalfi walking tour organised through Icnos was a highlight of our holiday. Your small company was amazing in making our trip memorable. Right from the start you and Anna responded to our enquiries comprehensively and always so promptly and all the information for the trip, ie maps, schedules, eating recommendations and accommodation was accurate and of high quality. The attention to detail in putting our package together was outstanding right down the the plastic carryall for the maps which came in very handy when it rained. Our first stay in Amalfi with Gabriella was particulary awesome and made a great starting point for our discovery of the Amalfi peninsula. The walk took us through breathtaking scenery, quaint and pretty villages and the smell and colour of the lemon orchards will stay with us forever. I can’t imagine a better way of seeing that part of the world. Thanks so much for your very personal attention and we look forward to meeting you again when we do another trip. “The groups at ICNOS are highly knowledgeable, keenly perceptive, passionate and over-the top caring. Marcello did an amazing job of accommodating every need of our group and has the gift of making guests feel like friends. ICNOS hooked us up with restaurants that were experiences, hiking that took our breath away, and exceeded our expectations in every way. I think anyone traveling to Italy would be wise to book with this team and ensure they get the very most from their vacation. “We have been wanting to write to you and have just now got the time. Thank you so much for providing us with the most memorable trip ever. Every aspect of the trip was perfect. We had no idea what to expect and it was all better then we could have imagined, from the pick up at the Naples airport to the drop off at the cruise in Civitavecchia, it all went smoothly. We so enjoyed you & Barbara and felt like we had made new friends in both of you. I hope that one day you and your wife are able to come to Vancouver Island and see where we live. Once again thank you for making our trip fantastic and maybe we can come and travel with you another time. We will certainly recommend you to everyone. I have attached a few pictures that you had asked for. We much enjoyed our stay in Tuscany. The holiday went smoothly and we really enjoyed the company of our guide, Sara. Apart from being a fun person she was so very knowledgeable on the region and just good company. The accommodation on the farm estate was fine, my only gripe would be that I would have appreciated an extra hook or two in the bathroom! In the evening it was lovely just to wander down to the dining room at the allotted time to enjoy a delicious regional supper. All the staff were extremely pleasant and seemed to enjoy working at Farmhouse, which made for a good atmosphere. Of course the setting was beautiful and I loved walking away from the busy areas.